How do impacts make Mars central-pit craters? • Formation mechanisms for central pits in Mars craters are tested with inferential statistics applied to data from image analyses. • Published hypothesized mechanisms provide expected observations for comparison to the collected data. • Results do not support any single previously proposed mechanism but operation of multiple central pit formation mechanisms is possible. Planetary bodies are hit by large objects such as asteroids and comets. These impacts create large depressions in the planetary surface. Some of these depressions have even smaller depressions, or pits, in their centers. The formation of these central pits is not well understood, although many ideas have been suggested. 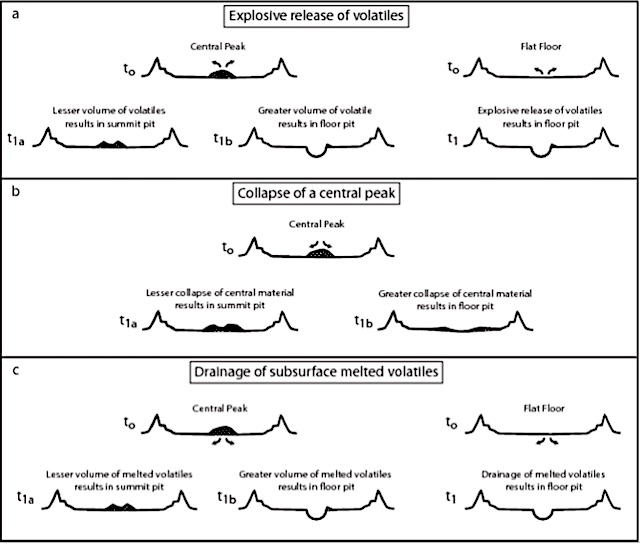 Here, we evaluate test a selection of these ideas by comparing the expected appearance of the central pit craters formed by these suggested mechanisms to what we observe in data from Mars. This entry was posted in Reports and tagged central peaks, central pit, impact craters, volatiles. Bookmark the permalink.